Many thanks to Jo in NY for once again testing my patterns. 1. Read instructions, for the size you will be crocheting, all the way through before beginning. 2. Beginning ch 2 does not count as a stitch through out pattern. 3. The first stitch goes in the same place as join. 4. When joining rounds with a slipstitch pull the stitch tight. You want it to nearly disappear. 5. There are instructions for two ways of adding beads to your work. See the adult’s 22 inch and the child’s 18 inch size to decide which method you like best. Depth at this point should be about 5 inches, if not work another dc round. Round 16: Ch 1, reverse sc in each sc (be sure to skip the stitch made by the slip stitch. Do not join, you will have a nearly invisible join if you fasten off and weave in end. Depth at this point should be about 4.5 inches, if not work another dc round. Round 14: Ch 1, reverse sc in each sc (be sure to skip the stitch made by the slip stitch. Do not join, you will have a nearly invisible join if you fasten off and weave in end. These are soooo cute. Thanks for sharing the pattern. I make hats for cancer patients, and for the homeless. This beaded hat is the hit of the room for the cancer patients..thank you, so much, for sharing. I wanted to thank you for sharing your pattern. 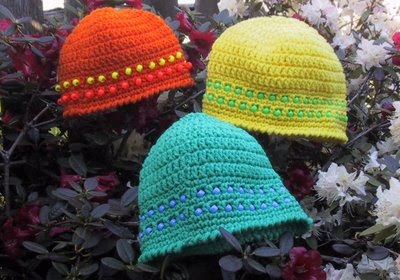 I am making hats for cancer patients and operation christmas child. They are so cute! God Bless you for sharing your gift of crochet with everyone!